Who are your favourite filmmakers, and what filmmakers inspired you to get into film? Films are inseparable from art. Making films is how humans respond to the world. It is our cave wall and for me, the biggest inspiration in my life has been great art; weather that is a Caravaggio, Jean-Michel Basquiat, or seeing great films such as Lawrence of Arabia, Rust and Bones or Turtles Can Fly… Films make us see different viewpoints… remind us: I am a part of this world; connected. That magic lantern will always be the most attractive of art forms for me. I can’t explain it any better than that. It was what I was born to do. How did you get involved with the BFI Screenwriting Academy? Ian Fenton is a dear old friend. He probably asked me since he couldn’t find anyone else! How did you find studying cinema in France, is it any different to the US and the UK’s methods? I am not sure I did ever study in any of those places. They were all unconventional experiences. I’d say, I am self-taught with cinema but from the stuff around me, I have gained a lot. 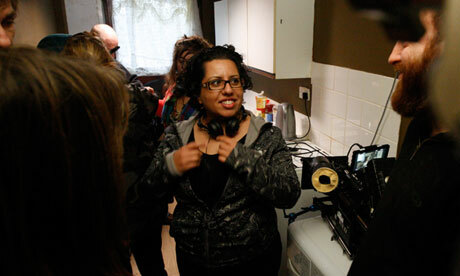 What inspired you to make I Am Nasrine and what did you do in order to prepare for a film centred around immigration? The film was made after I went to Iran after 23 years and returned to meet my mother. I was making a film for Channel 4 TV in the UK called ‘Mother/Country’. It was a remarkable, emotional experience and going to Iran really made me reflect on leaving this amazing culture and how, in some ways, children of migrants are third culture kids. Rather schizophrenic because they are neither from the East or the West. When I returned I realised I wanted to tell the story of first generation migrants— those who are neither “third culture kids.’ That story felt compelling for me. I didn’t feel it has been dealt with, yet it was such a common experience. So in 2001, I decided to invite immigrants to my house so I could make them dinner and talk to them about their experiences. It turned out most of the people who came were from asylum/refugee backgrounds. The exile experience is unique to many people, increasingly so, as we navigate identity, place and belonging. To write the script, I worked with a group of adults, and later teen, asylum seeker refugees (the project was called the Kooch Cinema Project), and new migrants and developed the story with them as I taught them to tell their own stories. I always make films from what I know. The character of Nasrine is a composite of many of the women I worked with over a period of 8 years as I developed the script for I Am Nasrine and also my own story, of course. I set up a filmmaking group in 2001 so at the same time I was writing this script that I would also share with the group. However, in the end there are masses of myself in the character because I could only write what I know. The nuances were added by Micsha Sadeghi who is very close to the character herself and a marvellous actress. The only incident that is factual is the murder of one of our group member’s brothers and this happened in 2002 but this is not his story. This was just part of the reality of what happens in these communities. The event in Sunderland was a catalyst for the group and also a sense of why this project was important. I wanted to humanise the asylum experience and help young people realise why people were in Britain and what that experience was about. Any advice to up-and-coming female directors and writers? ‘Thank you for getting in touch with me to ask a general “how do I get into the industry… or how do I get my foot in the door type question”. Wanting to do this for “ambitions sake” is not really going to pan out. Media and Film are not: cool, interesting or creative… well, not exactly. This is a very difficult, competitive industry which doesn’t usually lead to financial security or success in the way you may imagine. Sorry to have to burst your bubble. However, it is better to be truthful. My prognosis isn’t good though. I would tell your daughter (honestly) to stay in banking. Being a filmmaker is a terrible career decision. It is not a living. It is an addiction. It is only going to leave her penniless and very bitter and jaded. This industry is full of people who have gotten their start because of their family wealth or nepotism. It’s got terrible job security. It isn’t even very creative (90% admin, 10% creative at best). It is also, excuse the phrase, full of … very unpleasant people. Being a filmmaker means you need teflon skin. An ability to go 12 rounds in the ring with Tyson. And get up and do it again the next day. I would not wish this on anyone. It’s the worst thing in the world to do. However, if your daughter is adamant and we can’t put her off, you should tell her to get in touch and I will endeavour to give her some practical advice. However, I have to admit, I wouldn’t do anything else myself. I would recommend that you do enough research… yes. Perhaps coming to me was the first step…. But I can only give you a small amount of time so use it wisely! What do you need to do to get where you want to go? Please note: Most filmmakers (esp directors) are not making money to produce or direct their own films and aren’t able to support themselves JUST through this. Many people work in the commercial end (which quickly becomes very mechanical and creatively stifling) or do work which is complementary (I obviously also work in academia)… Some people work in grades which are creative but they help others: they are producers, editors or camera dept. Ask yourself: Do I REALLY want to do this? You don’t think you are good enough. Confidence is the currency of this game. You have to build self-belief and, if you are prepared to put in all the hard work…. And you are moderately gifted, you WILL make it. There are NOT ENOUGH good people (esp diverse) working in this industry. Most people who do it, do it for the wrong reasons, aren’t ready to put in the hard work and sacrifice… and really do it so they sound like an interesting person when their Uncle asks them what they do at the family Christmas meal. They rarely last into their 30’s. People drop off…. Yet talent will out. So what comes to the top are people who do this job for the right reasons (perhaps: because they have something to say… ). There is nothing wrong with being a lawyer, a dentist or a school teacher. These are all good professions. In many ways, I wish that filmmaking had the same status as being a plumber. Being a plumber is a good job… people need it. And also they can get paid very well. And sometimes when I am working 60-70hour weeks, I wish I was a plumber. PLACEMENTS (are the foot in the door, but be prepared to start at the bottom… and work hard to show what you are made of). BBC and other broadcasters are inundated with young people like yourself who want work placements, don’t take it personal but realise this is the reality of working in this industry. My suggestion is don’t go into media unless you absolutely have to. Yes, you can get a placement from many of the film companies in the North East but you need to be good to get anywhere in this industry. So this comes with a huge warning sign. You can try by looking for film companies in the NE. You can also try the company I work with. But you have to be VERY good to work there. Let’s see if you can use your initiative and the skills we would be looking for. IS YOUR STANDARD OF “GOOD” GOOD ENOUGH? Most people don’t realise what EXCELLENCE is. The skills that young people need are: organisational, communication, time keeping, problem-solving, negotiating and being incredibly GOOD. Most people who I have seen at the beginning of their careers are very poorly equipped for the workplace. This is usually because they don’t have enough work skills (they never had a Saturday job) and expect to go into a busy work environment and survive. My suggestion, get a job in a bar first. If you can handle a busy Saturday night in a bar or restaurant, you might be good enough for a production office. There are many similarities. There is nothing wrong with being a dentist, a plumber or a teacher. But if you do want to do it…. Good luck, you will need it! Laura Hague is 18 and lives in Newcastle, in the north of England. She tweets at ccaliforniadaze and blogs at ddoused.tumblr.com.She enjoys wasting her time on IMDb and wishing she was April Ludgate, and her three favourite films are (probably) Annie Hall, Pulp Fiction and The Wolf of Wall Street.